Last weekend, Brooklyn food writer Jennie Perillo lost her husband, Mikey. It happened suddenly. Without warning. Without time for goodbye. Without time for peanut butter pie. There has been an outpouring of love and support for Jennie and her young daughters on the internet. 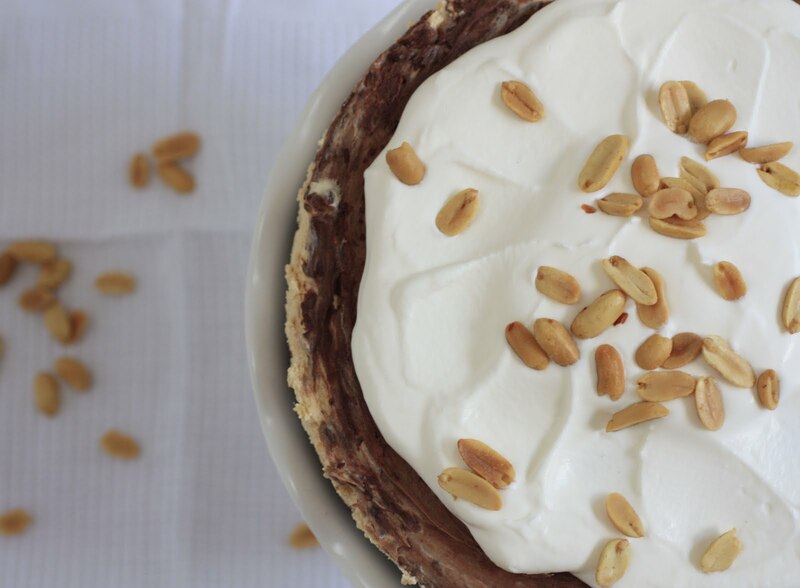 And in a beautiful and brave post, Jennie asked that those looking for a way to help make this peanut butter pie, one of Mikey's favorites, in his honor today. Jennie wrote that she'd been meaning to make this pie for Mikey again soon, but hadn't gotten around to it. "Share it with someone you love," she wrote, "Then hug them like there's no tomorrow." I haven't met my Mikey yet, so I can't share this pie with him. But I will share it with my family, with my friends, and you'd better believe I'll be eating a big old slice of it myself. I'm also going to use this pie as a reminder not to put things off until tomorrow. To do things, both big and small, today. Say hi to the cute stranger in the elevator. Bring your coworker cookies. Pick up the phone and say I'm sorry. Say I love you. Say whatever it is you've been meaning to say. Pay for your neighbor's latte. Call your mother. Smile at a stranger. Turn up the cheesy pop music and sing along. Buy flowers for no reason. Do it. Whatever your peanut butter pie is, do it today. No one knows what tomorrow will bring. So in honor of Jennie and of Mikey, lets all vow to make today as sweet as possible. With chocolate, with peanut butter, and, most importantly, with love. Pulse the graham crackers in a food processor until ground into crumbs. Pour the crumbs into a bowl, add the melted butter, melted chocolate and salt and stir with a fork to blend. Press into the bottom and up the sides of a springform pan, and put the pan in the refrigerator while you prepare the filling. Beat 1 cup of heavy cream to stiff peak stage, then transfer the whipped cream to the refrigerator until you're ready to use it. In the bowl of a stand mixer fitted with the paddle attachment, beat the cream cheese and peanut butter until light and fluffy. Scrape down the bowl, and gradually add the confectioner's sugar. Scrape down the bowl again, and add the sweetened condensed milk. Add the vanilla and the lemon juice and mix for a couple of minutes until well blended. Fold in the whipped cream, and pour the filling into your springform pan. Refrigerate for a few hours, or overnight. Melt the remaining 4 oz of semi-sweet chocolate, and let it cool a bit. Pour the chocolate over the chilled pie, and use an offset spatula to spread it to the edges. Chill until the chocolate layer is firm. Whip the additional cup of heavy cream, and mound it on top of the pie just before serving. Sprinkle peanuts over the top. Enjoy with someone you love. Great post save me some for tuesday! your blog is great, am your new follower, love your posts. Your pie looks delicious. I loved this post. We made our pie and ate it yesterday. As a matter of fact, I'm working on a slice of it as I write this. As I read your post, I decided to print a picture of the pie and place it in the front of my recipe binder. I want it to be a reminder in the future, not just for the time being. Thank you for that!